One autumn night, as a grad student named Matthew is walking home from the subway, a handsome skateboarder catches his eye. Leif, mesmerizing and enigmatic, invites Matthew to meet his friends, who are experimenting with tarot cards. It's easier to know what's in other people's minds than most people realize, the friends claim. Do they believe in telepathy? Can they actually do it? Though Matthew should be writing his dissertation on the poetry of kingship, he soon finds himself falling in love with Leif--a poet of the internet age--and entangled with Leif's group as they visit the Occupy movement's encampment across the river, where they hope their ideas about radical empathy will help heal a divided world and destabilize the 1%. When the group falls afoul of a security contractor freelancing for the government, the news coverage, internet outrage, and legal repercussions damage the romances and alliances that hold the friends together, and complicate the faith the members of the group have--or, in some cases, don't have--in the powers they've been nurturing. Elspeth and Raleigh, two of Leif's oldest friends, will see if their relationship can weather the strains of criminal charges; Chris and Julia, who drifted into the group more recently, will have their loyalties tested; and Matthew, entranced by the man at the center of it all, will have to decide what he owes Leif and how much he's willing to give him. All six will be forced to reckon with the ambiguous nature of transparency and with the insidious natures of power and privilege. 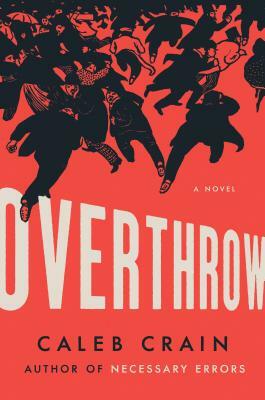 Overthrow is a story about the aftermath of the search for a new moral idealism, in a world where new controls on us--through technology, surveillance, the law--seem to be changing the nature and shape of the boundaries that we imagine around our selves. Caleb Crain, with astonishing sensitivity, acuity, and grace, has captured the deep unease and ambiguity that threaten our contemporary lives, and has written a beautiful novel about the redemptive possibilities of love and friendship. Caleb Crain has written for The New Yorker, Harper's, the Paris Review, The Atlantic, The New York Review of Books, n+1, and The New York Times Book Review. He is the author of the novel Necessary Errors and the critical work American Sympathy. He was born in Texas, raised in Massachusetts, and lives in Brooklyn, New York. "Necessary Errors is a very good novel, an enviably good one, and to read it is to relive all the anxieties and illusions and grand projects of one's own youth." "Ferociously observed. . . . We're not through with narratives about the Getting of Wisdom, Americans Abroad, Coming of Age, Gay Coming of Age, New Lost Generations. Among such works, a new narrative will be measured against Caleb Crain's fine book, which will endure as a powerful entry in the great fictional exploration of the meanings of liberation." "Remarkable. . . . Necessary Errors seems exceptional among recent American novels in how smartly it turns over the economic metaphors in so much American thinking." "Crain nicely captures the feel of two societies perched on the edge of becoming vastly more open—gay culture and the former Eastern Bloc—but where he really shines is in capturing the subtle, omnipresent disorientation of the expat experience." "Evocative. . . . Necessary Errors so completely recaptures the smells and scenes and political conversations and above all the feelings of 1990-1991 Czechoslovakia that I began to actively worry that Mr. Crain was inserting new memories into my brain." "Crain wonderfully evokes the novel's setting in a few deft strokes. He's a master of the thumbnail character sketch. . . . Line by line, the book is chock-full of masterly word choices and images. . . . On almost every page the reader is rewarded with gems. Necessary Errors heralds the fiction debut of a writer with intelligence and an engaging prose style." "A new model for contemporary fiction. . . . It recalls the dreamy pacing of Henry James or Elizabeth Bowen." "Caleb Crain's debut novel is at times reminiscent of Jane Austen. . . . [Necessary Errors] is a subtle and magnificent look at a kind of freedom that young, thinking Americans can't find by staying at home." "Crain's stately, wry, and generous first novel breaks the mold. . . . The adventures of American Jacob Putnam in Czechoslovakia right after the Iron Curtain's fall recall Henry James as much as they do Ben Lerner."